Chris Collins calls a play. The coach sat down with The Daily on Wednesday to give a number of offseason updates. With Bryant McIntosh, Scottie Lindsey and Gavin Skelly graduating, Isiah Brown and Rapolas Ivanauskas preparing to transfer and five new players coming into the program, this offseason is a chance for Northwestern to begin a new chapter. 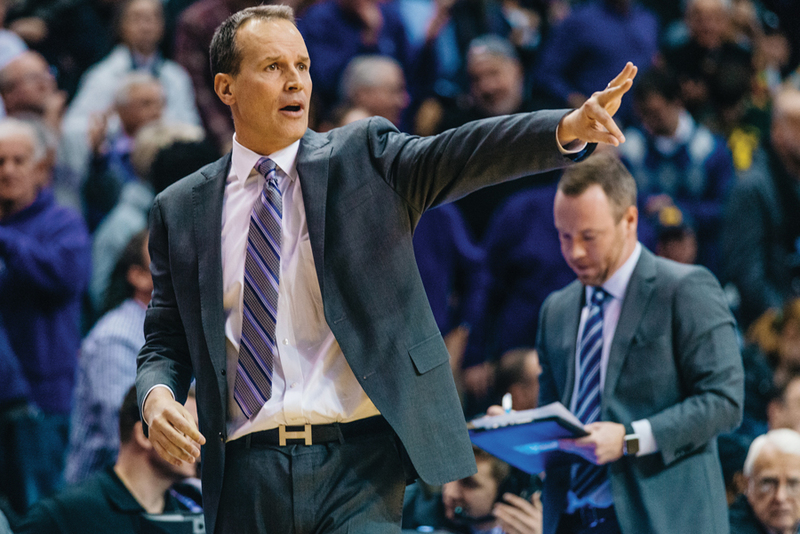 In the middle of the offseason grind, coach Chris Collins sat down with The Daily and Inside NU on Wednesday to discuss a number of recent happenings. Question: How have spring practices gone? Collins: Jordan Ash, Vic Law and Aaron Falzon have been out, but for the guys that have been able to be there all the time — Dererk Pardon, Barret Benson, A.J. Turner, Anthony Gaines — it’s been a really good six weeks for them. I’m seeing a lot of gains, no pun intended. The good part is Vic’s started to do more now, he’s able to do everything except contact… and Aaron was just cleared last week to start doing some stuff. Question: Why was the decision made for Vic to undergo a procedure this spring? Collins: He’s had problems throughout his career with fatigue, having to get him in and out of games a little bit, at times a little shortness of breath. With the procedure, the doctors feel that a lot of that can be alleviated. We’re also hoping it’ll help him maybe gain some more weight. He’s worked really hard in the weight room and he’s gotten stronger, but in terms of adding that mass, (he hasn’t been able to). Question: What was the process that led to Isiah Brown deciding to transfer to Grand Canyon? Collins: At the beginning of the year, he had a thigh injury that set him back, and I never really thought he got back into the swing of things. He wants to be in a situation where he can be in a really key role, where he has a chance to have the ball and be unleashed as a scorer, and I don’t think either of us were sure if he would ever have that kind of role (here). He’s going to have a year off to get healthy, get his game back, get his swagger back, and I think he’ll have two really good years at Grand Canyon. Question: How do you see Evansville grad transfer Ryan Taylor fitting into the team? Collins: He’s still going to score. Will he take the volume of shots that he took at Evansville? No. That’s just what his team needed from him. He’s excited to show when he’s placed with other guys that he can be an efficient passer and even more efficient scorer. I still think Ryan can be an 18-plus-point a night guy, but it’ll be with more efficiency. Talking to a lot of the guys in the Missouri Valley, his ability to make shots is at an incredibly high level, especially contested. Question: Are there any plans to fill the one available scholarship spot? Collins: Our eyes and ears are open. If there’s nobody out there that we think fits us and helps us, then we’ll sit tight with where we’re at, but we’re definitely still looking to see if there’s anything out there that can help our team. Question: What do you expect from the incoming recruiting class? Collins: You don’t know what to expect until they get here. I try to be really careful with freshmen — sometimes you can overhype. I’d rather undersell. Obviously on paper, it’s maybe as talented a class as we’ve had, but paper is not reality, and we’ve got to integrate them with our guys. Question: What are you most looking forward to about the new Welsh-Ryan Arena? Collins: I think it’s going to be a little bit different than what we face in our league. You see a lot of big, spacious, really nice arenas, and we’re trying to focus in on being very intimate, hopefully packed, loud, smaller-type experience. Once the arena opens up in September, we should be in there pretty much every day, which should be nice. We’re scheduled for the exhibition game (being) the grand opening, which you have to play against a Division II team. We’re still figuring out that opponent, but it’ll be during that first week of November. Question: When did you identify Emanuel Dildy as your choice to fill the vacant assistant coach spot? Collins: Talking to people I really trusted, coaches he’s worked for, he was a guy that just kept coming into the conversation. He’s a really hard worker on the recruiting trails, but he’s also a great on-court coach. You look at that whole Loyola team this year, he was there when they recruited Donte Ingram and Clayton Custer and Ben Richardson, which meant something to me. Question: Will Loyola’s Final Four run impact Northwestern at all? Collins: When you watch a team like that, you admire them and you watch what they do, but it also makes you hungry to get back to that level. Porter (Moser, Loyola’s coach,) has said their guys watching us the year before got them jealous to see our run and going to the tournament and how everybody got excited, and it was vice versa… for that month sitting back and watching everybody talk about Loyola. It gave our guys a little bit extra fire to get back in the gym.